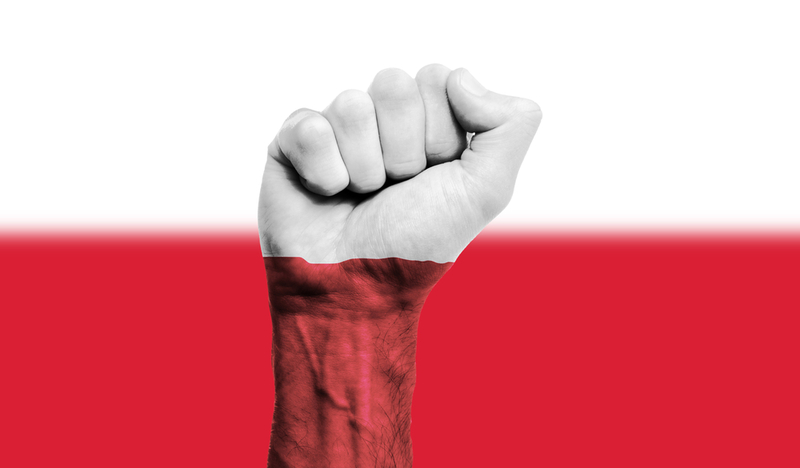 Poland’s striking teachers have three messages for the right-wing government of the Law and Justice (PiS) party: we care about the future of education, we are fighting for our dignity, and we are definitely fighting for our students. In their dramatic message to the parents and students during the examination period, the teachers emphasized that the current chaos at schools is the result of the 2016 school reform. “We want to teach, we want to work. Please, understand us,” they said. On Monday, teachers from 15,179 schools in Poland (74 percent) began a general strike after three months of fruitless talks with the ministry and government. The largest union, ZNP, wants a 1,000 złoty ($260) raise for every teacher in Poland. Teachers are among the lowest paid groups in our society, with monthly salaries ranging from $460 for junior teachers up to $920 for senior ones, which at best is 70 percent of the average Polish salary. It is difficult for teachers to lead quality lessons when they are worried about paying their own bills and feeding their own children. Nonetheless, Solidarity Union agreed to the government proposal of a 15 percent raise, just one day before the general strike. Individual members of the Solidarity Union decided to participate in the strike anyway. Solidarity’s ongoing policy of acting as a PiS government ally — an unthinkable shift from its nineteen-eighties values — is causing frustration among the Solidarity union teachers who decide to leave it. The students’ involvement is significant as well. Recently, students self-organized to support their teachers. Due to the national education minister Anna Zalewska’s reform (nicknamed “deform”), schooldays now end late in the afternoon, with numerous instances of seven-year-olds finishing classes at 6 p.m. and students feeling overburdened by the new curriculum. What is more, the costly and unreasonable reversal of 1999 three-level system (six years of elementary, three years of junior high school, three years of senior) aimed to centralize education has reintroduced the ideological curriculum that was a distinctive feature of the communist era before 1989. With only six months of “preparation” for such a substantial change, is it any surprise that the reform didn’t account for complications? With the final closure of gymnasium (junior high school), junior graduates and the new eight-year elementary school alumni will be enrolled together in 2018/19. In consequence, there are now twice as many students competing to enter high schools. The question arises whether we should still consider that the right to education, as per Recommendation CM/Rec (2012) 13 of the Council of Europe, to be fully exercised in Poland. Is our education of adequate quality? Teachers’ demands for better education and working conditions were met with government propaganda and insults. Listening about the budget limitations for months, the teachers heard a surprising announcement two days before the strike. PiS leader Jarosław Kaczyński has promised generous handout of 100 zł ($26) per pig and 500 zł ($131) per cow for farmers. With its brutal timing and context, the campaign promise became an offense to teachers and has caused even greater mobilization to participate in the strike. Among the most ridiculous responses from PiS party members was the suggestion that teachers should get pregnant in order to receive the 500 zł per child-care benefit; the minister, meanwhile, proposed a raise — by increasing teachers worktime by six hours a week. In consequence to such a strategy, 30 percent teachers would lose their jobs! Another suggested solution to the crisis was to employ anyone who has pedagogical qualifications, even if they have never worked as teachers. Journalists have reported “humorous” incidents in which priests, nuns, politicians, or — most recently — three firemen have been sent into schools to run an exam ten minutes before it is due to start. The last act of this tragicomedy will most probably end with nullifying the students’ recent exams due to the breach of the law and procedures. The teachers are faced with government propaganda on national TV, radio, and social media, including an “information campaign” by professional PR firm, which disseminated untrustworthy survey results on the lack of parents’ and society’s support of the strike. There are also growing accusations that PiS is hiring internet trolls. The society’s response to the strike is, however, quite unexpected and contrasting with the popular depiction of the lazy teacher with two months of paid holidays. Parents, students, surgeons, actors, and others have added exclamation marks in their Facebook profile pictures, taken solidarity photos captioned in Polish and English, and brought sweets to staffrooms. Workplace managers have allowed employees to bring in their kids, while grandparents and friends have offered to take care of the children. Libraries and museums have organized extra classes, local governments have promised not to cut the teachers’ salaries during the protests, and students have written messages of support with chalk at school yards. For the majority of teachers, however, this strike, the largest since 1993, may end quite soon, due to the pressure of the loss of wages. Polish teachers urgently need the support. If the teaching profession still has value in our society, it is time for this strike to receive international attention. Beata Zwierzyńska is a doctoral candidate at University of Lower Silesia and Masaryk University; involved with European Council of Doctoral Candidates and Junior Researchers. She can be found on Twitter @beatazwie.